We are a leading Manufacturer, Supplier and Exporter of Ultrasonic Jewelry Cleaner. Ultrasonic Jewelry Cleaners, offered by us, is so powerful that it can clean with water alone. 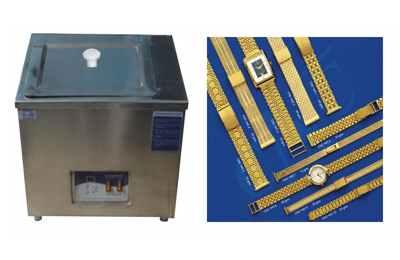 This digital Ultrasonic Jewelry Cleaner is extensively used for cleaning jewelry, necklaces, earrings, rings, bracelets, coins, watches straps, bands, etc. Ultrasonic Jewelry Cleaning Machine is easy to use and is extremely safe. Why Ultrasonic Jewelry Cleaner ? Conventional cleaning is done by scrubbing, soaking, etc. It consumes lot of time; it may not be done properly at best of times and it is not possible to reach in to crevices. These can only be removed by using our Ultrasonic Jewelry Cleaner. Ultrasonic Jewellery Cleaners offers 100% safe method using ultrasonic cleaning effect. High frequency, high intensity Ultrasonic sound waves are produced and the vibrations are transmitted through the water or cleaning liquid. Myriads of bubbles are created and the sudden collapse of these minute bubbles is called cavitation. The collapsing bubbles creates highly effective and a safe scrubbing action on both exposed and hidden wet surfaces. For Extra Cleaning Power: Just add water with your cleaning solution and it creates millions of microscopic cleansing bubbles that goes deep into places not reachable by hand or brush. The jewelry cleaner wipes out traces of the most difficult buffing compounds and agents using Tripoli, rouge, lime diamond Tripoli, etc. Micro Controller base Digital Timer. Modular generator for easier modification / servicing. Frequency 25 OR 33 KHz + 3 Hz. Input voltage range of 170AC-270AC.